The Colorado Rockies are big believers in the Buddy system. 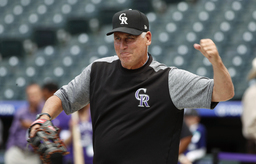 Manager Bud Black's easygoing demeanor strikes just the right chord with an up-and-coming Rockies team that's made back-to-back playoff appearances for the first time in franchise history. His success was rewarded Monday with a three-year contract extension that runs through the 2022 season, the team announced from spring training in Scottsdale, Arizona. "Buddy has seamlessly become part of our leadership fabric," general manager Jeff Bridich said. "Our organization as a whole is better for it." The 61-year-old Black has posted a 178-147 record since being named Colorado's manager on Nov. 7, 2016. His .548 winning percentage is the best in team history. That's one big deal out of the way. Still looming is a possible long-term contract with All-Star third baseman Nolan Arenado, who signed a $26 million, one-year contract to avoid arbitration, the largest one-year deal for an arbitration-eligible player in baseball history. No deadline has been set on talks with the Rockies for a deal. Arenado is coming off a season in which he batted .297 and had an NL-leading 38 homers. That's a name Black wouldn't mind penciling into the lineup for years to come. One of the things the Rockies front office appreciates about Black is his patience. He's a calming influence throughout the twists and turns of a grueling season. "There are those stress points in any season, in great seasons and not-so-great seasons," Bridich said. "There's a consistent kind of calmness being able to breathe and calm things down in the face of fire or unfortunate events or if things don't go your way. There's a lack of panic (with Black). He does a good job of leaning on experience. It's not all about Buddy - he leans on the people around him and leans on the folks that are empowered to do their jobs." Colorado is coming off a 91-72 season in which the team challenged for the NL West title - the organization has never captured one - before losing in a tiebreaking game to the Los Angeles Dodgers. The Rockies beat the Chicago Cubs in the NL wild-card game before being swept by the Milwaukee Brewers during the NL Division Series. That was on the heels of losing to Arizona in the NL wild-card contest in 2017. A solid nucleus remains intact from a year ago, including a young pitching staff. The Rockies bolstered their offense by adding Daniel Murphy and the plan will be to move Ian Desmond into the outfield. The Rockies did lose second baseman DJ LeMahieu and reliable reliever Adam Ottavino off a team that spent 25 days in first place in the NL West and four more days in a tie for the top spot in `18. "I'm excited to be here because of where we are," Black said. "People in the game, people in the know, are talking about the Rockies, which is a great thing." Black has been an NL Manager of the Year finalist in each of his two seasons with the Rockies. He won the award in 2010 while with the San Diego Padres. He's always thought of himself as a mentor, whether it's in a managerial role or in his earlier days as a pitching coach. That was also the case throughout his pitching career. Just one of the reasons why Bridich believed Black would be a quality leader for a young Rockies team. "Anytime you're looking for somebody to add to your leadership process, you're looking for a certain fit," Bridich said. "For us, it's the personality, the competency fit, a vision fit - in terms of do we see the future similarly or the potential for the future similarly? Are we going to be able to share that vision as we actually get to work and march forward together? Are we committed to the work it takes? That was at the core of a lot of it. "Throughout the season, the collaborative process that has to happen in order for us to get the most out of our players, Buddy is right at the forefront."